Step 1 Mix spices together in a small bowl. Preheat your grill to medium-high. Step 2 Shuck the corn, leaving one layer of husk covering each cob. Cut off the silk at top of corn. Step 3 Place the corn on the grill, close the lid, and grill for a total of 15 minutes, rotating the corn ⅓ turn every 5 minutes, until the corn is cooked and the husks are slightly charred. Step 4 Remove the corn from the grill and carefully shuck the corn (hot!). 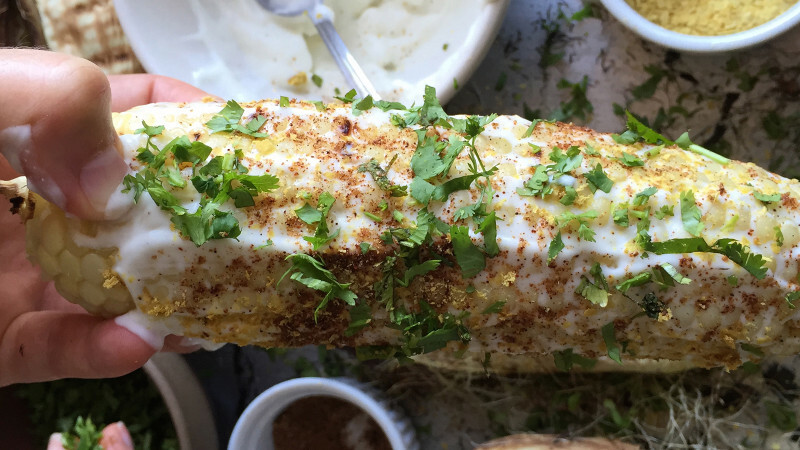 Brush each cob with mayonnaise, sprinkle some of the spice mix and cheese (or nutritional yeast) on the corn and top with cilantro. Step 5 Note: To make it vegan, swap nutritional yeast for cotija cheese and use a vegan mayo of your choice. There are only so many classic corns on the cob Opens a New Window. you can chomp on until you hit your limit. Not so with this Mexican riff on the grilled, buttery classic. Known as elote, this simple dish is a popular street food throughout Mexico and served at Mexican restaurants throughout America, typically as a side dish.